Buckingham County was formed in 1761 from Albemarle County. In 1778, a small area bordering the James River was given to Cumberland County with another portion given for the formation of Appomattox in 1845. Another change to the boundary with Appomattox County was made in 1860 when Buckingham's borders were finally set. There are two mindsets as to the derivative of this county's name. It is thought the name came from England's Duke of Buckingham. However some believe it came from a plantation owned by Archibald Cary named Buckingham on Willis Creek. Buckingham County consists of 582 square miles with the county seat being Buckingham. Records dating before 1869 were lost when fire destroyed Buckingham Courthouse which had been designed by Thomas Jefferson. Buckingham County, lying south of the James River at the geographic center of the state, was established on May 1st, 1761 from the southeastern portion of Albemarle County. The origin of the county name probably comes from the Duke of Buckingham (Buckinghamshire, England). Some sources say that the county was named for Archibald Cary's estate "Buckingham" which was located on Willis Creek. This is the only Buckingham County in the entire United States. In 1778 a small triangular area bordering the James River was given to Cumberland County. In 1845, another part was taken from Buckingham to form the northern portion of Appomattox County. 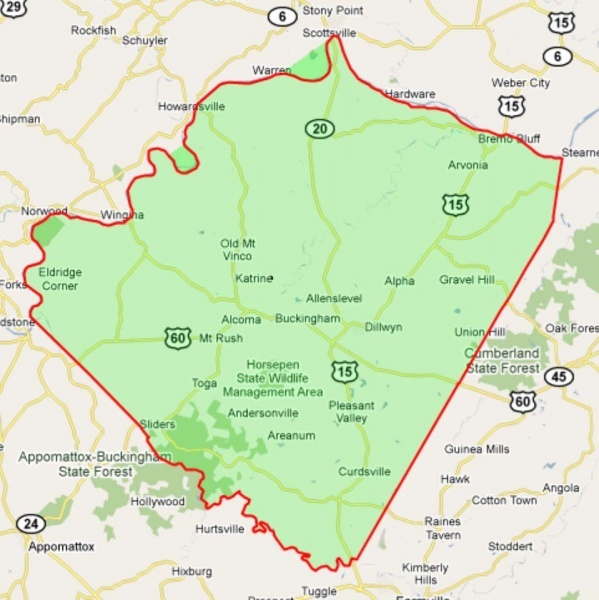 A final adjustment of the Appomattox-Buckingham county line was made in 1860 and Buckingham's borders then became fixed in their current form. 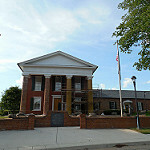 A fire destroyed the courthouse (designed by Thomas Jefferson) in 1869 and most of the early records of this county were lost.